For those who came in late, this issue recaps what the Scooby gang has been fighting against for the past 34 issues. But it thankfully avoids a great deal of unnecessary detail and is able to boil it down to a page or two. Goody. But it’s not a recap just to catch people up; it also leads into the motivations of the enemy and its goals. With the introduction of the Nanite King last issue, we have finally met the enemy (at least the one pulling the strings), though Velma’s ne’er-do-well brothers run a close second. And they’re here as well, which no doubt provides another level of conflict for all concerned. But it also suggests that the end of the story may be on the horizon; time will tell. The creative team on this series has been amazingly consistent, suggesting a level of commitment seldom seen in contemporary comic books. Not only is their work of the high quality necessary in today’s market, but each member of the team seems dedicated to the title. Granted, it’s not a high profile book like Superman or Justice League, but sometimes it’s good to be off the beaten path. Many a restaurant, cult film or character actor has achieved greater success by being a consistent, quality product. 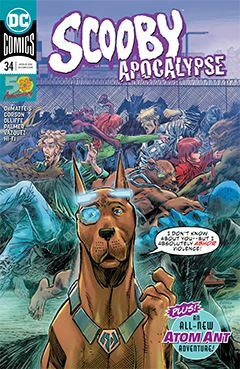 If Scooby Apocalypse comes to an end, I will miss it. It’s told a good, engaging story without being an episodic head ache. Maybe there will be a sequel series, or DC Comics will focus its efforts on the mainstream Scooby-Doo franchise books. That may not be the worst thing.